Adverse events and high school football have both been around for a while. The two have often intersected during the long period while the two have existed simultaneously. These instances are frequently chronicled by purveyors of the written word. As a result, Greg Nichols' Striking Gridiron, which recounts a western Pennsylvanian team's attempt at breaking the consecutive win record in the midst of a steel strike, enters a pretty crowded field. The book is well-written and researched and decently enjoyable, though there isn't really enough to separate it from similar fare. The book covers the 1959 season of the Braddock Tigers as they loom on the verge of the longest winning streak in high school football. Led by coach Chuck Klausing, a hard-nosed leader with a preference for character-heavy players high in "intestinal fortitude" the Tigers have become a force in one of the more football-crazy regions of the country despite Braddock's poverty and declining economy, going undefeated in 5 consecutive seasons. The Tigers' 1959 campaign is further complicated by a massive steel strike that began in July that saw half a million steelworkers walk away from their jobs, which understandably dealt a humongous blow to the local economy. Striking Gridiron follows the conventional setup of basically progressing through the season chronologically with occasional asides to further explore the backgrounds of Klausing or his players. Nichols had extensive cooperation from major players including Klausing and also culls from abundant newspaper and radio resources. Nichols vividly recreates life in 1950s western Pennsylvania and the importance of football to Braddock. There are some amusing anecdotes as well, such as Klausing working with US Steel employees to construct a rudimentary blocking sled for his players and Pittsburgh mayor David Lawrence employing some creative bureaucratic tricks in getting Klausing accredited as a teacher. The basic format and content reminded me of countless other books such as Our Boys where a team of hardscrabble youths proceeds to beat the pants off of the bulk of its competition. I won't divulge any big spoilers here but a few of the Tigers' games aren't particularly competitive and are pretty difficult to make exciting. 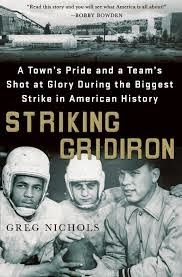 While Nichols does devote a decent chunk of the book to describing the steel strike and the impact on Braddock's economy, Striking Gridiron is still fundamentally a football book focused on the Braddock Tigers and their coach. This is to some degree a drawback, as there is little to make the book stand out. If you don't read about high school football very often and/or have an interest in the culture and economy of western Pennsylvania then Striking Gridiron is probably worth reading or at least seeking out. While Nichols is a strong writer and the book is a decent read overall, I can't recommend it too highly to those more versed in the "this is the account of one team's attempt at attaining gridiron success in the face of some kind of adversity" genre as it treads some familiar territory.